When I quit my job, one of my dreams was to start a podcast. It was a complicated goal. I searched online forums and Facebook groups for relevant advice. I tried reading popular blogs on the subject of starting a podcast. Nothing stuck with me. Where was I going to get this information? And not just any information… detailed, organized, in-depth, updated, and relevant information. I didn’t just want to find out what microphone to use. I wanted to learn how to create, grow, and monetize a podcast. I wanted to find interesting people to interview. I wanted to learn exactly how the pros were doing it, and network with them. This was a difficult task on my own. I didn’t find what I was looking for in a blog, a cheap course, or browsing Google. The author, Napoleon Hill, spent a few decades hanging around some of the most successful businessmen & politicians in the world. He studied their success, and published his findings in “Think & Grow Rich.” This book exploded in popularity throughout the 20th century due to the evergreen principles it lays out for success. By “evergreen” I mean that these principles are as much true as in 1920 as they were in 1980, 2015 and beyond. One particular chapter caught my eye. It was the chapter explaining what a “master mind” group was, and why the world’s most successful people outsource knowledge from others. Hill specifically spotlighted Andrew Carnegie, one of the most successful businessmen ever. Carnegie built a massive steel empire, US Steel, and eventually sold it to JP Morgan in 1901 for 480 million dollars. I repeat… 480 million, in 1901. That number in 2015 would translate to 300-350 billion dollars. Hill noted that although Carnegie built such a successful empire, he knew almost nothing about steel himself. Carnegie’s success could solely be pinpointed to the fact that he outsourced his knowledge from others (politicians, financiers, managers, businessmen) who knew how to do things way better than he did. If Carnegie didn’t know how to do something, he would put others in charge that knew how to do it right, instead of learning solo. After reading that again, I realized… I can’t do it all on my own. I needed to absorb the knowledge of others who already knew what they were doing, and leverage those connections to network with those who could help me achieve my professional goals. When searching the Internet for podcast masterminds, I found that one my favorite podcasters, John Lee Dumas (Entrepreneur on Fire) had started his own “mastermind” of sorts called “Podcaster’s Paradise.” Maybe it wasn’t intended a mastermind, but it was an online course with a closed Facebook group attached. It was certainly an investment. Not too expensive, but not cheap. I thought about it, and realized that joining was the only way to achieve my goal of starting my podcast. I joined Podcaster’s Paradise right after I quit my job, and was immersed into a sea of entrepreneurs who knew way more than I did. Fast forward to today, and I feel like I have someone… really a friend, for advice on anything. I have a sales funnel guy, my web developer, an expert in television, book publishers, social media experts, authors, video editors, email list-builders, paid speakers, dozens of podcasters… the list goes on! It wasn’t just the first-hand connections I made within the mastermind; the second-hand connections I made from recommendations were amazing. For example, if I have a question about radio, I know a podcaster who came from the radio world. But I could also ask him who does good voice-overs, or who to contact at a radio station for interviews. These adjacent, second-hand connections are super easy for anyone in a mastermind group to give out. However, they would be hard to find if you didn’t have that initial first-hand connection. So it’s not just the people in the mastermind group who can help you grow. Their network can also be tapped for information, advice, and resources. It wasn’t just the first-hand information I was gaining either. Sure, I learned a ton about how to create, grow and monetize my podcast. That was the whole point of joining. But I also learned way more… because I needed to set up a website, build my email list, and write blog articles. Those within “paradise” had done that before. You’ll find the same thing when joining a solid mastermind group. You will run into an unrelated issue and find yourself turning to those within the group for help. It happens all the time. I have also joined a real estate investing mastermind (that is way more close-knit at about 70 people). Now, I feel I have a good handle on what to look for when joining a mastermind. Here’s some helpful advice if you’re looking to join a “mastermind” of your own. Look at Return on Investment Value, Not Cost. Think about the benefit you will get out of joining, more than the dollar cost of joining. There are only really two numbers here to quantify: How much you pay, and how much you get back. These kinds of investments are hard to gauge because one number is nearly impossible to put a dollar value on, and the other, usually fairly high, is sitting there… staring you right in the face. These are all completely valid points. No matter who you are, you have more value to deliver than you think! In a mastermind, age doesn’t matter, and experience is worth way less than respect and honesty. If you quantify what your goal is worth to you financially, then it’s much easier to tell whether joining a mastermind group is worth your time and money. Let’s say you want to become a published author. That dream is likely worth thousands of dollars to you in the future—maybe $5,000 within the first year. If you look at the $5,000 you can make within the first year, the opportunity to land paid speaking gigs, and the time you will save by writing right out of the gate (after joining the mastermind) an initial investment of $1,500 might not seem that intimidating. And on the other hand, if you didn’t join the group and went at it alone, your success might never happen. The dollar amount makes sense to me because I know the relationships and social equity I get out of the group will be worth way more than the cost to join. If a mastermind group is $1,000, ask yourself if you would join for $83 a month, or $19 a week for one year (that’s $1,000 either way). And then ask, “How long would it take to learn these skills without any help?” That cost of time wasted spinning your wheels is almost surely worth more than the initial investment of $1,000. I recommend doing a bit of research on the topic you’re interested in, because you might find that the information is readily available online, or there are several mastermind groups out there. If you find that there is no quality information readily available, like I did, then joining a group of others is likely the way to go. If there are several options, and you are still unsure, you can always contact someone within a mastermind and ask pick the one that’s right for you. I was devastated this week when I found out that Scott Dinsmore was killed while climbing Mount Kilimanjaro. Scott was an amazing lifestyle entrepreneur, one of my biggest heroes, and a huge reason I had quit my job this year. For a little reminiscing, I jumped to the video of Scott’s TEDx talk in San Francisco, “How to Find & Do What You Love.” It’s funny, I’ve seen the video before, but I didn’t remember him mentioning this… he talked about surrounding yourself with passionate people. Scott said: “The fastest way to do things you don’t think can be done, is surround yourself with people who are already doing them.” Due to inspiration from winners like Scott, I have never been more inspired to do something I love. And I know I can’t succeed alone. 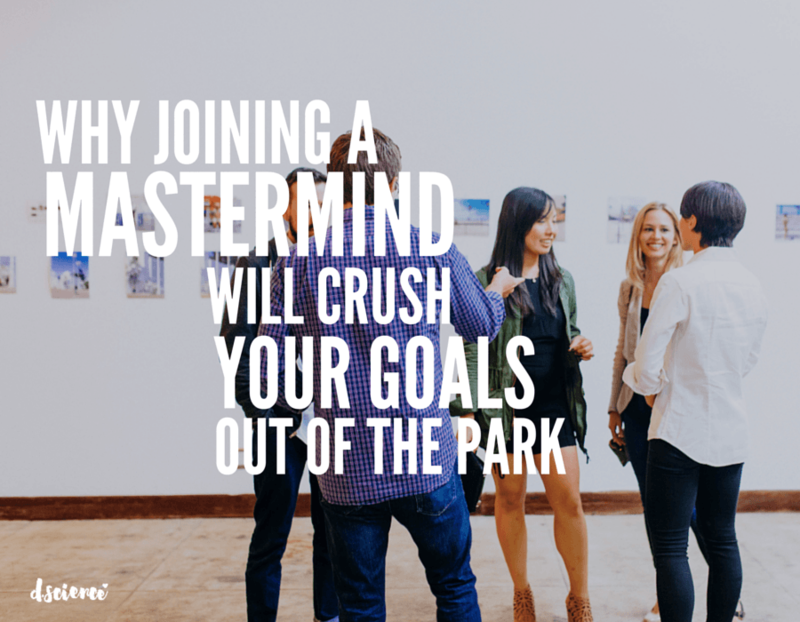 Have you been in a Mastermind Group? What benefits did you receive? Let us know in the comments!